Top photo: CreateNYC staff at Field Day 2016 Bed-Stuy. Over the past few months, The Laundromat Project’s staff, artists, and community members have engaged with CreateNYC, DCLA’s process to develop a city-wide cultural plan that will be approved by City Council in July 2017. The Laundromat Project, through the participation of Kemi Ilesanmi, Executive Director, and Hatuey Ramos-Fermin, Director of Programs and Community Engagement, have supported CreateNYC through an ongoing partnership with Naturally Occurring Cultural District NY (NOCD-NY), which is a CreateNYC project partners along with lead project partner Hester Street Collaborative. In addition, our 2010 Create Change Artist-in-Residence Tattfoo Tan was appointed by the Mayor to be on the Citizen’s Advisory Committee. The Project Partners and Citizen’s Advisory Committee advise DCLA on the development and implementation of the cultural plan. During the development of the Cultural Plan, the Committee meets at least quarterly, and after its completion, the Committee will get together every two years to make recommendations to the Commissioner of Cultural Affairs in response to DCLA’s update on the implementation of the plan. Over the past six months, we’ve engaged with Create NYC in a number of ways. 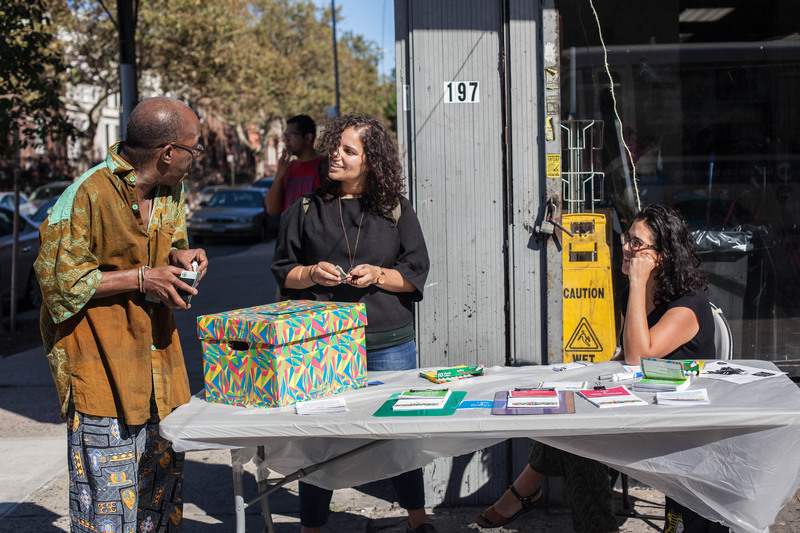 For our 2016 Field Day events in South Bronx and Bed-Stuy and our Public Art Potluck (at Sadie Nash Academy), we collaborated with the CreateNYC team to collect input on what NYC residents want to see in the cultural plan. In addition, Kemi was a facilitator at the CreateNYC Manhattan Workshop, which took place on December 20, 2016 at Harlem Stage. 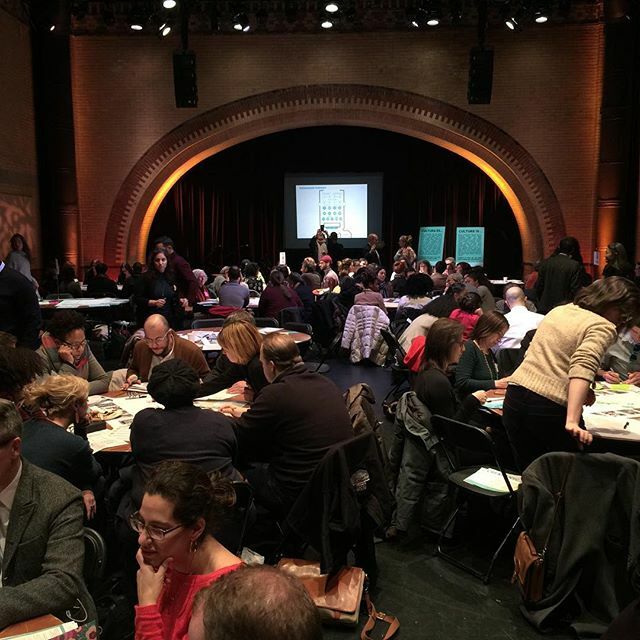 This workshop was one of a series of workshops that took place in each of the five borough where attendees discussed their ideas, shared priorities, and crafted recommendations for the future of arts and culture in NYC in small groups relating to key issues identified by DCLA. 2011 Create Change Artist-in-Resident Latasha Diggs performed for the opening of the Manhattan workshop before the breakout sessions. Alicia Grullon, Artist Catalyst, and I also were in attendance as participants. You can see a livestream of the convening here. In February, I attended “Office Hours with the Commissioner: Culture, Access, and Technology,” which gathered a citywide cohort of arts and culture staff at Google’s offices in Manhattan to share their input on how technology can further access to the city’s cultural resources. 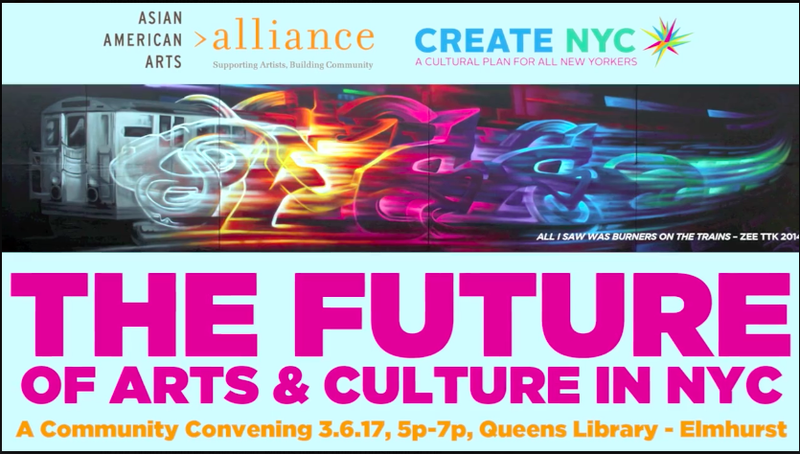 I also had a chance to facilitate a CreateNYC conversation at the Asian American Arts Alliance’s “The Future of Arts & Culture in NYC” Community Convening” on March 6 at Queens Public Library in Elmhurst, where Queens residents and Asian American Pacific Islander artists and cultural workers had a dedicated opportunity to voice what they hope the Cultural Plan will address. Alicia Grullon shares her input at a CreateNYC Workshop. 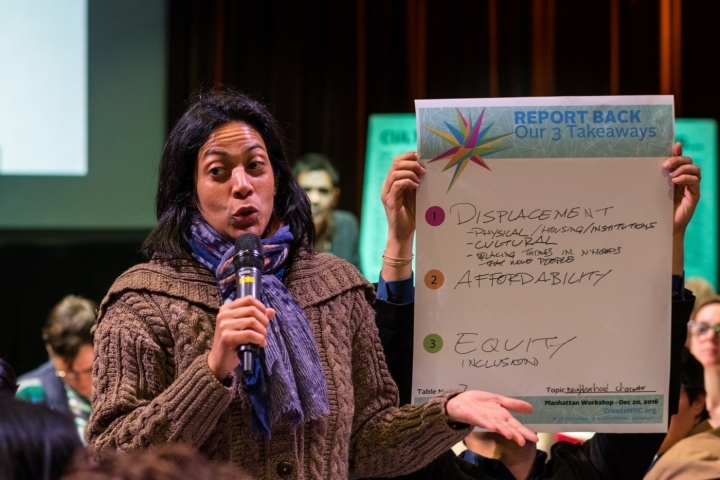 From our involvement and conversations around CreateNYC, we found that our staff, artists, and community members are interested in how the cultural plan will address issues relevant to the arts: equity, access, affordability, social and economic impact, education, public art, citywide coordination, and neighborhood character. Based on my own particular experience and interest, I emphasized that the issue of “labor” should also be addressed in relationship to “equity” and its relationship to “social and economic impact” in the arts. Through her own organizing efforts, Alicia, working in the South Bronx, strongly advocates for public policy that benefits community-based groups and working artists, as well as careful consideration of the relationship the arts can have with gentrification and housing displacement. The Laundromat Project and Department of Cultural of Affairs would like to know what your thoughts are on these issues being covered in the cultural plan before April 1, 2017! You can share your thoughts with the DCLA through the Cultural Participation Survey or Artist & Cultural Worker Survey. Additionally, you can email The Laundromat Project at info@laundromatproject.org if you’d like us to amplify your input to the city.